In August of 1964, 14,000 retirees arrived by the busload in Atlantic City. Representing the National Council of Senior Citizens (NCSC), the former railroad workers, dressmakers and auto assemblers marched 10 blocks up the fabled New Jersey boardwalk to the Democratic National Convention at the Convention Hall. 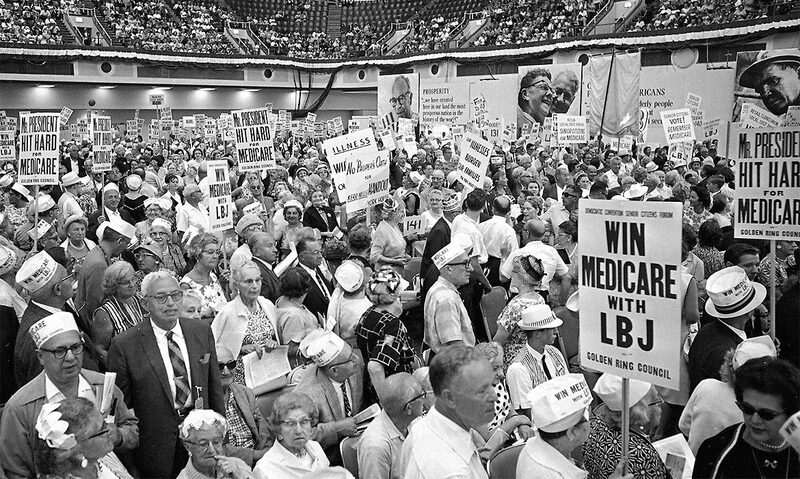 The group, which was organized and bankrolled by the AFL-CIO, moved en masse in floral housecoats and sandwich boards with slogans like “Our Illnesses Burden Our Families” and “Senior Citizens Vote, Remember Medicare.” They intended to push President Johnson to extend public health insurance to millions of Americans. Astonishingly, less than a year later, they won. Medicare was signed into law in July of 1965 in Independence, Missouri, at a ceremony attended by former president Harry S. Truman, whose push for national health insurance (NHI) had collapsed nearly two decades before. The landmark law created a public-sector insurance pool for Americans 65 and over, which remains today the closest thing to a robust universal entitlement in the US health-care system. Its successful passage (also passing Medicaid, to insure the very poor) stands in sharp contrast to multiple failed efforts to install a universal single-payer system. 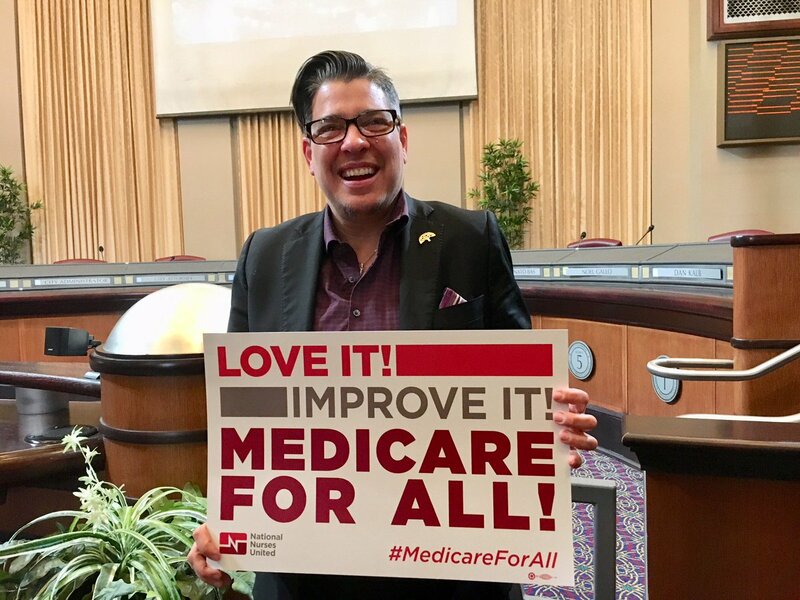 A half-century later, we’re witnessing the early stages of yet another popular thrust toward single payer, increasingly billed as “Medicare for All.” The nomenclature intends to evoke associations with the popular, trusted program, which is perhaps easier for Americans to latch onto than a phraseology that threatens to trigger a tedious lesson in comparative health policy. 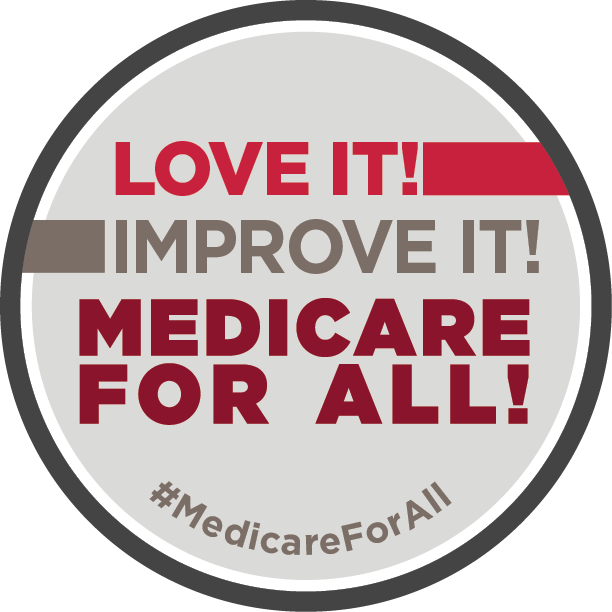 But if the conceptual jump from Medicare to Medicare for All can serve as a rough model for achieving universal health care in the United States, we should also look to the history of the social movements that achieved something that then, too, seemed impossible. 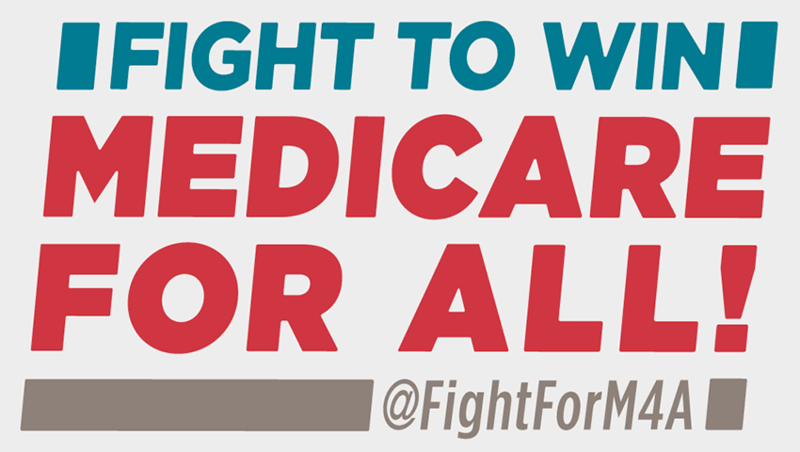 No one imagines expanding Medicare to all Americans will be easy. Nothing quite like this has ever been accomplished in the United States. Yes, dozens of peer countries have built coherent, humane universal health-care systems out of entrenched private ones. Yes, mass movements have won major leftist reforms. Yes, advanced private industries of various nations have been nationalized. But human history offers no examples of these things happening in combination, which is what winning Medicare for All will require. Other countries’ publicly financed health-care systems were built atop systems far less entrenched and commodified than ours, and therefore presented far less of a threat to capital. The most recently implemented single-payer system was devised in 1995 in Taiwan, a country whose health-care system was underdeveloped after decades of repressive governance followed by decades of mega-growth. The UK’s National Health Service—a fully socialized system of financing and delivery—sprouted from the wreckage of World War II, not high-performing investor-backed hospital chains. And while there are many examples of robust public-entitlement programs’ being privatized, there are few instances of the opposite. This is perhaps why critics such as Hillary Clinton have said that the establishment of single payer in the United States will “never, ever come to pass,” the implication being that it’s not even worth trying. The most viable push toward NHI in American history crumbled in the late 1940s, ruthlessly crushed by not only insurers and pharmaceutical companies but also the American Medical Association. (Physicians, whose already handsome salaries began to rise in the postwar era, feared the blow that NHI could strike to their paychecks, professional prestige, and autonomy, since a government payer would also reduce their control over prices.) As such, the AMA famously shook down its membership for $25 apiece to fund the multimillion-dollar campaign that injected the phrase “socialized medicine” into mainstream American culture. In this context, it’s perhaps tempting to view Medicare as a capitulation to industry pressure and political challenges, rather than as evidence they can be flouted. After all, Medicare (and, for that matter, Medicaid) targeted the most vulnerable patients. Many single-payer skeptics insist that Medicare managed to pass because it covered the people private insurance left behind. In his book Harry S. Truman Versus the Medical Lobby: The Genesis of Medicare, historian Monte Poen presents Medicare as a sort of compromise between the unfettered free market and the dashed dreams of the 1940s. While it’s true that the enactment of Medicare didn’t pose nearly the threat to certain health-care industry stakeholders that the NHI did or that Medicare for All would, it would be a mistake to fully dismiss its applicability to the current political fight. For one thing, the common talking point that Medicare extended insurance to a population who didn’t have it, rather than squashing existing private infrastructure, doesn’t bear out. A full half of elderly Americans did have private insurance plans when Medicare was signed into law. 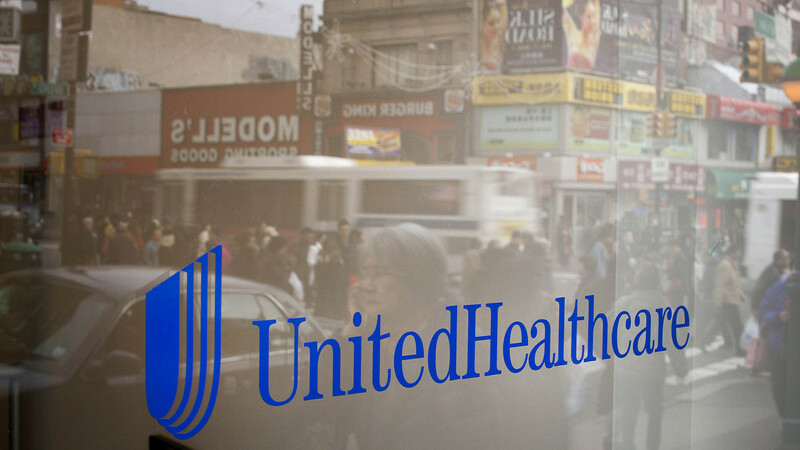 Commercial health insurers initially opposed the program, and began to support it only when it became clear a large administrative role would be preserved for for-profit insurers. More importantly, while insurance companies certainly fought against health-care-financing reforms, physicians associations and hospitals are typically considered to have been the more significant opponents—they believed Medicare to be a likely conduit for eventual full-scale single payer (and all the government interference they assumed would come with it), and struck back with more or less the same zeal that they mustered decades earlier. 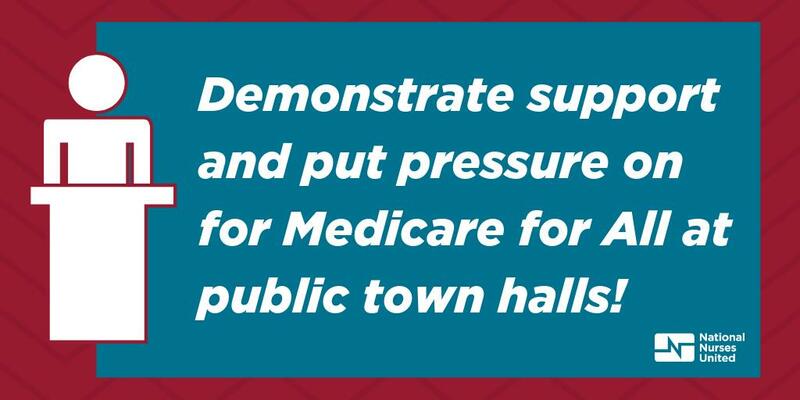 As historian Jill Quadagno puts it, the AMA fought Medicare with “every propaganda tactic it had employed during the Truman era.” Such tactics included a widespread media blitz, advertising in doctors’ offices, and visits to congressmen from physicians in their districts. One tactic, called “Operation Coffee Cup,” deputized physicians’ wives to host ladies’ gatherings, at which they’d play their guests an anti-Medicare PSA starring actor Ronald Reagan. This time, the AMA and its allies failed, but not for lack of trying. So it’s unfair to ascribe Medicare’s triumph to a lack of industry resistance, which was actually quite strong. The more crucial variable distinguishing Medicare from the NHI battles that fizzled before and since was a mass movement of people demanding it, having coalesced at a moment when powerful liberatory struggles against white supremacy and poverty had transformed what could be deemed politically possible. Organized labor went all-in for Medicare, which took substantial pressure off unions for their retirees’ mounting health-care costs. Their enthusiasm contrasted with their relationship with universal initiatives before and since, despite their largely supporting most on paper. The reasons for labor’s tepid support for single payer have been debated by historians: for one thing, their success at collectively bargaining for employer-provided health benefits during the Truman-era reform battles perhaps reduced their motivation to prioritize national health-care solutions, the ongoing absence of which almost certainly highlighted the advantage of union membership. Since the 1970s, ever-rising health-care costs strengthened the case that labor’s interests would be served by removing health-care benefits from tense contract negotiations, but declining labor power during America’s rightward political shift tied them to a Democratic Party establishment unwilling to back single payer during health-care debates of the 1970s and ’90s.